If you don't want to have this behavior, then you can choose to disable it in the Settings screen. The option is selected by default. Some parts of the world uses Sunday as the first day of the week and some others use Monday. OneCalendar used Sunday. Now I added an option to change this to Monday. Find the option in the Settings screen. Mouse wheel inside a day: Scroll the list of pages for that day. This will only be active if there are enough pages on that day that the up/down icons show up. OneCalendar had 4 different font sizes: Very Small, Small, Medium, Large. For those of you who like to see things bigger, I added two more font sizes: Larger and Extra Large. Check them out in Settings or use your mouse wheel with Ctrl or use Ctrl +/-. By the way the Ctrl +/- shortcut would only work with the + and - keys on the far right of the keyboard, that is the ones on the number pad, but wouldn't work with the + and - keys on the number line next to the backspace. I hooked that up for laptops that don't have a number pad. That is it. Enjoy the new features. Let me know your impressions and new ideas for improving OneCalendar or the Onetastic add-in with your comments below. I am using a lot of different OneNote Books during the day and use this at the end of the day to summarize where I made changes on a daily page. It would be really great if could copy the links from OneCalendar into OneNote. Are there any macros that would do this? I noticed that page previews on the calendar do not display if the page is a sub page, and the sub pages are collapsed under the parent. Instead of a preview the message "Failed to load preview for this page: The file does not exist" is displayed along with the path of the parent page. If I go back to the notebook and expand all sub pages, then the preview will display. It suggests that I have to leave all notes expanded. Please review this for a possible improvement to display page previews (along with full path) whether the sub page is collapsed or not. Thank you. I think the calendar is a great idea but we are using OneNote in our office to track job information (Graphic Design Firm). I am playing around with the adding to Outlook Tasks feature of OneNote (would be cool if it actually opened the task so I could edit information, assign it to someone etc. Anyway, as far as the calendar it would be great if it would be populated by other criteria such as the due date that I assign to a page or job rather than by last modified date. 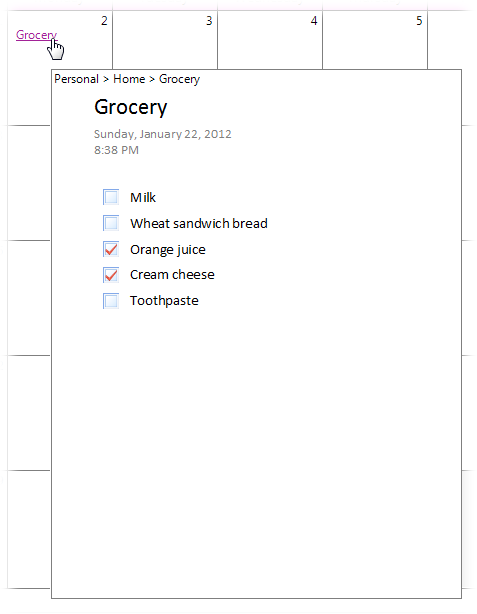 I need a traditional diary inside Onenote: Appointment entries and tasks. Strangely enough, I can\'t seem to import one. Mmmm. I will try again. I\'ve been using ON since 2003 and loving it... and have been feeling the lack of powertoys for 2010. Thanks SO MUCH! Such a great and elegant add-in you\'ve created. Thanks a lot. Onetastic is an extremely useful add-on to OneNote. This is great. I really appreciate the functionality Onetastic adds to my favorite MS office program. Thanks for your work.